Congratulations ! The original artwork is available for purchase for $1150.60 shipping included. You will be able to review this purchase in the subsequent screens. If you have a question, please email support@pastelspace.com. Purchase 1108 x 800 pixel digital file by using the Buy Now buttons below. You will receive an email with the download link. You can use the link 5 times to download the digital file. "Everyday rituals in my village" is a 15" x 20" watercolor on paper painting by acclaimed artist Arpita Basu. Two boats on the banks of the river. Fishes swimming. Village women on their way to fetch water. Village women with indoor chores. Cow herdsman. a man astride a buffalo. A decorated mat, turtle, a snake, an owl, a crane have all found their place in this beautiful canvas. 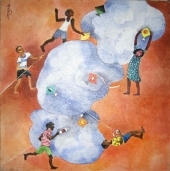 Born in 1964, Arpita, the artist of this work, completed her M.V.A. from the Rabindra Bharati University, Kolkata in 1992. She has won several awards, notable among them the Rajya Charukala Exhibition of West Bengal State Government- in 1987, The National scholarship, Govt. of India-1990-1992 & a Grant from "The Pollock-Krasner Foundation Inc.", New-York, U.S.A in 1998-99. 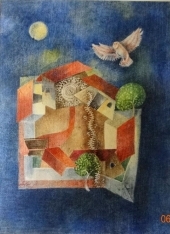 She has held several shows at prominent galleries all over India & her works have been collected by major art institutions, such as the Victoria Albert Museum & others..
New artwork uploaded. 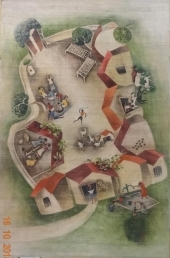 "Everyday rituals in my village" is a 15" x 20" watercolor on paper painting by acclaimed artist Arpita Basu. Two boats on the banks of the river. Fishes swimming. Village women on their way to fetch water. Village women with indoor chores. Cow herdsman. a man astride a buffalo. A decorated mat, turtle, a snake, an owl, a crane have all found their place in this beautiful canvas. 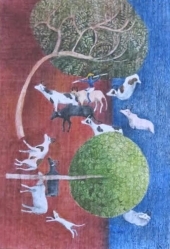 Born in 1964, Arpita, the artist of this work, completed her M.V.A. from the Rabindra Bharati University, Kolkata in 1992. She has won several awards, notable among them the Rajya Charukala Exhibition of West Bengal State Government- in 1987, The National scholarship, Govt. of India-1990-1992 & a Grant from "The Pollock-Krasner Foundation Inc.", New-York, U.S.A in 1998-99. She has held several shows at prominent galleries all over India & her works have been collected by major art institutions, such as the Victoria Albert Museum & others. Born in 1964, Arpita completed her M.V.A. from the Rabindra Bharati University, Kolkata in 1992. She has won several awards, notable among them the Rajya Charukala Exhibition of West Bengal State Government- in 1987, The National scholarship, Govt. of India-1990-1992 & a Grant from "The Pollock-Krasner Foundation Inc.", New-York, U.S.A in 1998-99. 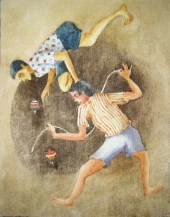 She has held several shows at prominent galleries all over India & her works have been collected by major art institutions, such as the Victoria Albert Museum & others.